Order a cab in seconds, Be on your way in minutes. Be on your way in minutes. We have made ordering taxis easier and more reliable than it's ever been. We've taken the hassle out, so you're on your way faster & stress-free. No typing required, just select your pickup location from a list. Taxi Mojo also remembers your recent locations to save you time. Watch it happen live on your screen or rely on status notifications. No more agonizing over the whereabouts of your ride. Prefer a non-smoking car? Want to pay with your credit card? We've got you covered. Prepaid fares save Time ... and your Sanity. Hate it when drivers don't show up? Now you can do something about it. 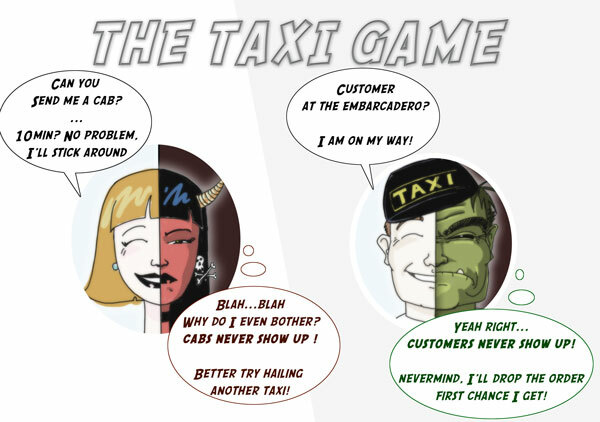 Drivers who fear flaky customers will often drop an order at the first opportunity. Passengers who fear a flaky driver, will get into the first taxi driving by instead of waiting for the cab they called. When you prepay $10 for a ride, you are essentially telling taxi drivers: "Here is a $10 guarantee that I won't flake as long as you show up in the next 10 minutes". This makes your order much more attractive to drivers and you get better service as a result.